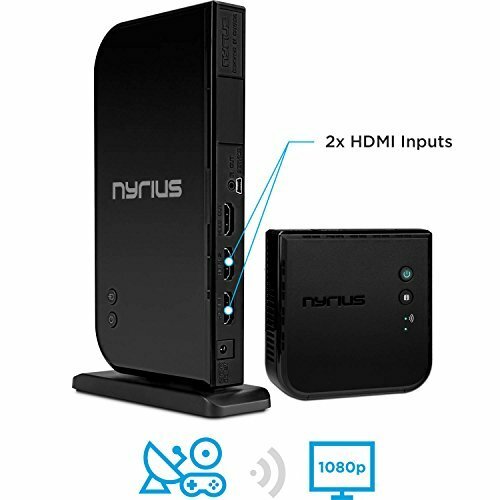 Wireless streaming of your favorite movies, TV shows, and video games is easy with the Aries Home+. In just minutes you can set up an enhanced wireless home entertainment experience that broadcasts all your media in razor-sharp, high definition with 3D. Wirelessly transmit the signal from your Blu-ray/DVD player, digital cable box, satellite receiver, laptop, or gaming console up to 100ft away and conveniently switch between any two of these devices without unplugging. This system transmits uncompressed, vivid video in real time with zero latency through walls, floors, and ceilings without interfering with other common wireless devices such as WiFi or Bluetooth. With loop-through HDMI capability, the Aries Home+ lets you set up two separate viewing environments, so you can broadcast the game through one wired connection in your living room and one wireless in your man cave. The included extender allows you to control your media device from any area of the home. Change channels, pause your movie, adjust volume - any function will work. Simply point your remote control at the receiver and press your remote control’s button - it’s that easy. The ARIES Home+ can handle nearly all resolutions from various devices to display on televisions of any size. This means that you will have no trouble sending video games from your PC or your favorite TV show from your cable box. Just plug the transmitter into your devices HDMI port and the receiver into your HDTV and you’re immediately connected. No software or WiFi connection required. The transmitter has 2x HDMI input and 1x HDMI output (loop-through to local TV) and the receiver has 1x HDMI output.